4 Nov, Online, Virtual Learning! Summit Live! Researchers at Carnegie Mellon investigated student behaviour and outcomes on an ‘Introduction to Psychology as a Science’ Coursera MOOC, comparing those who took it as a traditional MOOC, spending most of their time watching video lectures, with those who combined the MOOC and interactive materials produced by Carnegie Mellon’s Open Learning Initiative. Learning Is Not a Spectator Sport: Doing Is Better Than Watching for Learning From a MOOC reports that those in the MOOC-only course scored an average of 57% on the final exam (N=215) whereas those in the combined course averaged 66% (N=939). And when students in the combined course completed an interactive activity, they learned six times as much as those who only read the material or watched a video. “When one is watching a lecture or reading material, there’s an illusion of learning,” says Prof Ken Koedinger. The additional “Learn by Doing” interactive activities support student outcome achievement by providing feedback targeted to diagnose misconceptions plus robust hints to support students. A report published in the Harvard Business Review draws on a survey of 52,000 Coursera students to look at their motivations and what kinds of educational and career results they are seeing. The report sorted students into two categories and the results are somewhat horoscope-like: of those who described themselves as career builders, 87% reported “career benefits” from their courses; and of those described as education seekers, 88% reported general educational benefits. When pressed for more tangible benefits, the figures were lower, at 33% (e.g. found a new job) and 18% (e.g. gained essential knowledge for my field of study) respectively. MIT has announced a pilot project in which students will be able to take a semester of free online courses in one of MIT's graduate programs and then, if they pay a "modest fee" of about $1,500 and pass an exam, they will earn a MicroMaster's credential. That cost includes $150 for each of the five (‘free’) online classes, plus up to $800 to take the exam, with the MicroMasters being equivalent to half of the university's one-year master's degree program in supply chain management. Udacity is expanding into India, a country it believes “has the potential to have the #1 developer population by 2018.” The company will offer 1,000 full scholarships to its Nanodegree program in Android development, courtesy of Google and Tata Trusts. Standard tuition for any of the seven Nanodegrees will run 9,800 rupees (approximately £100) per month, with a 50% rebate after completion. Each program, on average, takes six to nine months to complete. As Coursera claimed 15 million registered users in August, edX announced passing the 5 million student mark and Udacity’s Sebastian Thrun said the company serves “some 4 [million] registered users worldwide, and about 60,000 working on nanodegrees at anyone one time”. He also added that more than 60% of Udacity students complete their courses. A survey by Hefce found that only 28% of new university programmes attracted enough students to be sustainable. However, this is a big step forward compared with an older analysis of 2005-08 UCAS data that showed just one in 10 new single-subject degree courses managed to recruit at least 10 to 15 students (researchers at the time suggested that 15 to 30 was probably the minimum viable figure). The Economist reports that the abolition of tuition fees in Scotland has done little to widen access to HE. The proportion of students from state schools entering Scotland’s elite universities has fallen since 2011 and although the proportion from non-professional backgrounds has risen by 0.2 percentage points (to 26.8%), the equivalent rise in England was 2.2 percentage points (to 33.1%). The chairman and governing board of Glasgow Clyde College have been removed by the Scottish government. Education Secretary Angela Constance said the outgoing board had "failed to discharge its duties on a number of counts". These included "breaching clear rules on expenditure limits, allowing its relationship with student representatives to break down, and failing to investigate governance concerns raised by the principal before her suspension". UK universities will work with organisations in China on joint academic research and new institutions under an agreement between the UK and Chinese governments. A total of 23 education agreements were signed at the 8th UK-China Education Summit last month, which will see UK universities and organisations working with partners in China on higher, vocational, school and sports education. And seven Scottish universities are in discussions with 20 Brazilian universities and government agencies to try to develop new research partnerships between the two nations, focusing on areas of shared research interest such as environmental management, air and water pollution, agriculture, aquaculture, fisheries and geology. The University of Exeter has announced an “international partnership” with Pearson to develop online masters' degrees “in a variety of subjects”, starting in Sep 2016. Pearson already helps run more than 70 online degrees at Arizona State University. The new courses will include weekly interactive online teaching sessions delivered from university faculties. Exeter described the OU as “terrific” but said the new courses would explore “some of the really exciting work and discovery that's happening at Exeter” as well as taking it “to as many people as possible around the globe”. Pearson hopes to buy the e-assessments division of LearnDirect, which oversees the UK's national citizenship test and Driver & Vehicle Standards Agency (DVSA) testing (thought to be the largest online assessment contract in Europe). This will be the company’s first deal since selling the Financial Times and The Economist for more than £1bn and it accelerates Pearson's reshaping into an education and training-focused company, building on its global operations across school, higher education and job-related testing. However, it appears that the Competition and Markets Authority is looking into the deal. The Japan Times reports that plans by Pearson to scrap A and A-S levels in Japanese could threaten the future of Japanese language study in England. Over 3,500 people have signed a petition calling for the exam to be retained, arguing that removing the only qualification in Japanese for 16- to 18-year-olds is likely to reduce the incentive for younger students to take up the language in the first place. Discussions are ongoing with the Department for Education to find a way to save the qualification. At last, Rupert Murdoch has found a buyer for his failed education venture, Amplify. The company fired about 500 of its 1,200 staff and the following day he sold it to a management team that includes Amplify’s CEO, Joel Klein. Laureate Education, the world’s largest for-profit college company, filed for an Initial Public Offering last month. More than 1 million students are currently enrolled in schools owned by Laureate – four times as many students as were enrolled at the for-profit giant University of Phoenix in 2014. However, the company posted a net loss of $169m in 2015, and has $4.7bn in debts, compared to assets of $8bn. The US Department of Defense has barred the University of Phoenix from recruiting on military bases and preventing troops from using federal money for classes. The OU is set to team up with The British Council to teach English, French and German language skills to approximately 3,000 displaced Syrian refugees who have temporarily settled in Jordan and Lebanon. Around 300 of the highest achieving students will be able to progress to OU accredited online degree courses and there will also be opportunities for at least 400 to continue their studies by taking a short online course on FutureLearn. Syrian refugees now represent an almost 10% increase in the Jordanian population of six million and, in Lebanon, this figure is around 20%. Berlin-based Kiron University has partnered with more than 20 others throughout the world to offer a free, three-year program that will grant students an internationally accredited degree. More than 15,000 potential students have already approached the school and, in order to offset the costs, Kiron is crowdfunding scholarships and has so far raised over $170,000 from 950 contributors. 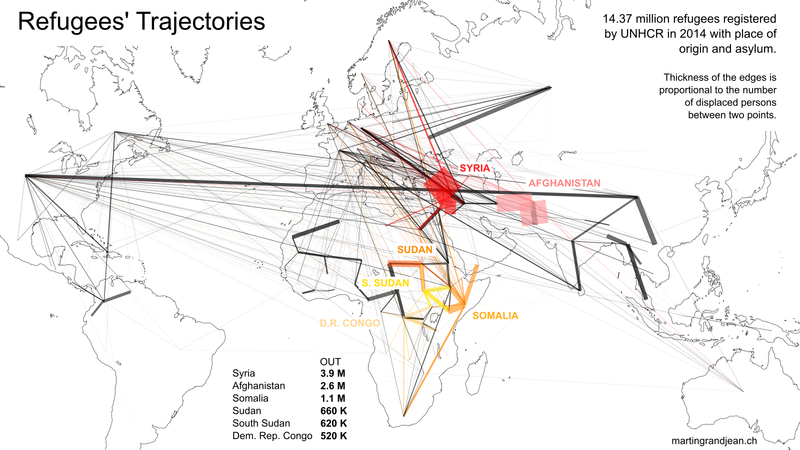 And a New York Times visualisation shows the source and destination of the 14.4 million refugees registered by UNHCR who fled their country in 2014. OECD’s Students, Computers and Learning: Making the Connection examines how students’ access to and use of ICT has evolved in recent years, and explores how education systems and schools are integrating ICT into students’ learning experiences. However, considering there are nearly 200 pages of detailed OECD data, the concluding implications are fairly underwhelming: we should teach and invest in digital foundation skills; raise awareness of the possible harmful aspects of internet use; train teachers and develop coherent plans for using ICT in the classroom; and learn from past experience when making future investments in technology. A research study report from Prospects College of Advanced Technology (PROCAT), Technology Solutions for Further Education Learning, investigated students’ access to and use of technology, as well as student expectations of the college in helping them gain skills, experiences and attributes in the use of technology. Top of their wants/expectations were robust wi-fi, availability of devices (laptops were preferred over tablets because of their keyboards) or the ability to use their own, and access to printers. Some 97% owned a smartphone, 82% a laptop and 69% a tablet. The new Nepris site aims to, “make it easy for teachers to virtually invite industry professionals into the classroom to bring real world relevance to curriculum topics”. The aim is to help evaluate student projects and to engage and inspire students in ‘STEAM’ topics. Matt Ramirez reports on the Jisc Blog on five emerging trends for innovative tech in FE and HE, claiming that augmented and virtual reality (AR/VR) are becoming firmly accepted by the education sector for adding value to learning experiences. His post includes links to some useful tools and exemplars. But might the costs of kit make VR too expensive? Google killed that myth with its under-£10 Google Cardboard, designed to turn your smartphone into VR googles, although you couldn’t exactly describe it as a stylish solution. There are also rumours of a similar device from Microsoft. But now comes the new $99 Samsung Gear VR, made by Oculus and compatible with the whole 2015 line of Samsung Smartphones including the Note 5, S6, S6 Edge, and S6 Edge+ when it ships next month. There will also be a new Gear VR Gamepad, featuring an Xbox-style dual-stick design. Microsoft has released a preview of a project called Snip which allows non-techies to quickly and easily create Khan-like narrated learning resources such as screencasting, highlighting text, sketching, labelling, and taking and annotating photographs. New UK consumer protection measures came into force in the Consumer Rights Act on 1 Oct. Entitlement to a full refund on faulty goods now lasts for 30 days after the purchase (rather than the previous "reasonable time"). There is also new protection for buyers of online digital content, with entitlement to a replacement if downloads do not work (but not a refund) and providers liable to pay compensation for virus removal if infection was due to the download. The act also opens the door for class action law suits where claims for compensation can be made on behalf of a group of people. Up until now you could only buy Harry Potter ebooks from the Pottermore site – downloadable to Kindle, iPhone, iPad, Nook, Kobo and others for £5.99 each. But now, if you have an Apple device that supports iBook Author (IBA) format, you can take advantage of enhanced editions created by Apple with JK Rowling’s team and including new animated illustrations, interactivity, exclusive author notes, custom typefaces, drop caps and other goodies. Yours for just £6.99 in English from the iBooks Store, with French, German and Spanish versions available from 9 Nov.